ANK body chains are handcrafted. Made from eco-friendly metal. Plating: Gold finish Measurement Small, Medium to Large One size fits most. The Artemis Body Chains, our second shoulder piece design, is inspired by our initial shoulder chain, the Abelardus, to carry the weight of nobility on one’s shoulder. The chains were fashioned to elegantly envelop both shoulders. Falling on the sides of the body. were fashioned to drape confidently on the shoulder, enveloping the curves and draping the front of the body. A more masculine feel, the Artemis represents independence, courage, confidence and physical strength. The Artemis has been part of ANK's creations since 2012. ANK body chains are handcrafted. Made from eco-friendly metal Plating: Rhodium finish Measurement Small, Medium to XLarge. One size fits most. The Artemis Body Chains, our second shoulder piece design, is inspired by our initial shoulder chain, the Abelardus, to carry the weight of nobility on one’s shoulder. 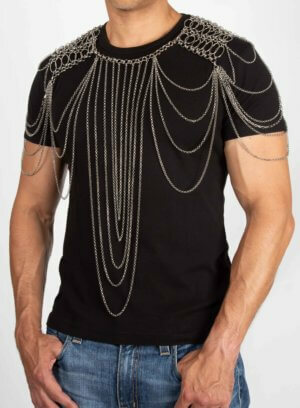 The chains were fashioned to elegantly envelop both shoulders. Falling on the sides of the body. were fashioned to drape confidently on the shoulder, enveloping the curves and draping the front of the body. A more masculine feel, the Artemis represents independence, courage, confidence and physical strength. The Artemis has been part of ANK's creations since 2012. ANK body chains are handcrafted. Made from eco-friendly metal Plating: Rhodium finish Measurement One size fits most. Gabriella Body Chain, our other shoulder piece design, is inspired by our initial shoulder chain, the Artemis, to carry the weight of nobility on one's shoulder. The chains were fashioned to elegantly envelop both shoulders. Falling on the sides of the body. Gabriella is the more feminine version representing independence, courage, confidence and physical strength. ANK body chains are handcrafted. Made from eco-friendly metal Plating: Gold finish Measurement Small, Medium to Large. One size fits most. 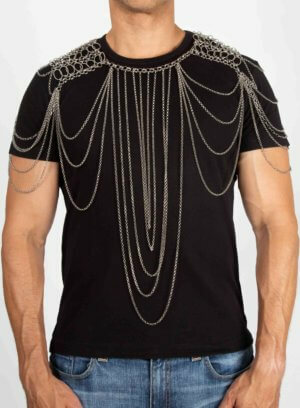 The Java Body Chain simply rest on your shoulders. ANK body chains are handcrafted. Made from eco-friendly metal. Plating: Gold finish Measurement Small, Medium to Large One size fits most. This shoulder piece can be worn on either shoulder. ANK body chains are handcrafted. Made from eco-friendly metal. Plating: Rhodium finish Measurement Small, Medium to Large One size fits most. ANK body chains are handcrafted. Made from eco-friendly metal. Plating: Gold Plating Measurement Small, Medium to Large. Extensions will be provided for Medium to Large sizes. 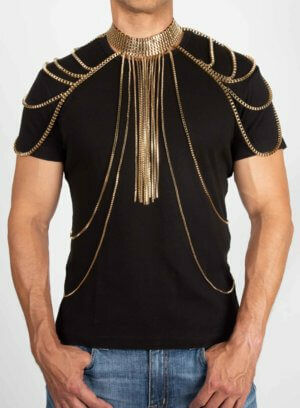 The Toga Body Chain was specially designed for Toga dresses. 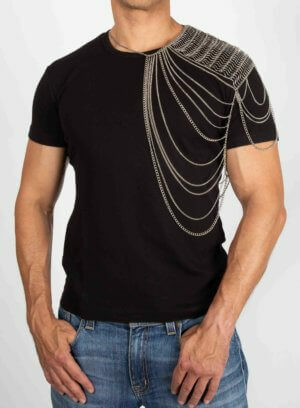 The body chain envelopes the left-side of the shoulders. This piece is worn on the side with the bare shoulders. ANK jewelleries are handcrafted. Made from eco-friendly metal. Plating: Gold Finish Measurements Small, Medium to Large. One size fits most.